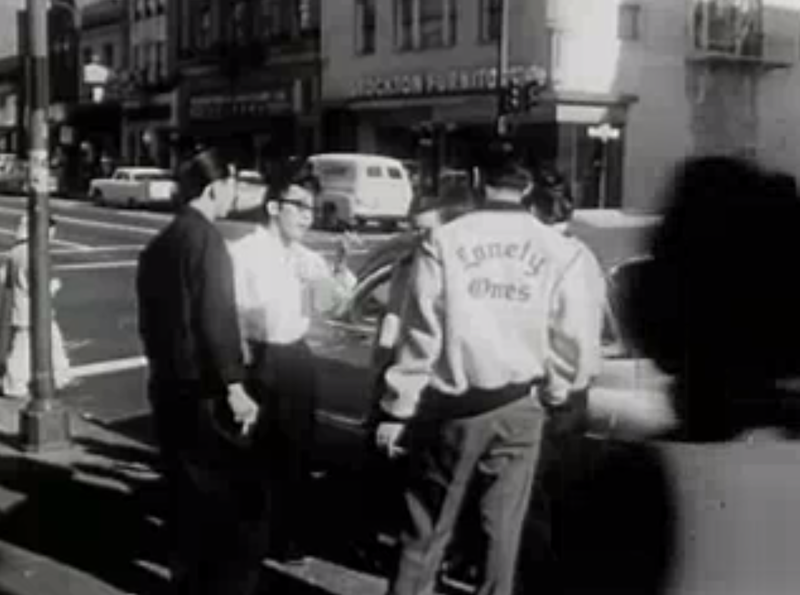 “Ask Me, Don’t Tell Me,” an amazing short film that I learned about through the Bernal Heights History Project, shows a glimpse of San Francisco street life in the late 1950s. (The film was published in 1961, but the aesthetic of its “juvenile delinquents” seems to owe more to the 50s, so let’s call it that. The 60s in San Francisco brings to mind flower children, which these aren’t.) It’s got some dated moments, but sparkles nonetheless as a little historical treasure. The film is more interesting to me for its poetic pastiche of street scenes (and gritty bongos-infused blues) than it is as a record of the program, Youth For Service, that it was made to promote. I’ve never seen anything like this, nor have I read very much about these scenes in San Francisco. But as I watched the clip, I felt like I knew this world, if obliquely. These young men were the progenitors of the San Franciscans I grew up around. In their gestures, their expressions, their postures, and their voices, they foreshadow the later Bay Area culture with which I’m much more familiar. Growing up, I didn’t know about any gangs with names like the Lonely Ones or the War Lords (feel free to correct me in the comments if I was simply oblivious — a distinct possibility). And aside from motorcycle clubs, the days of wearing cuts had passed by the time I was watching the city through Muni windows. But in the slouched posture of kids on the back of the 14 Mission, in their slang, in the braggadocio and micro-awareness of neighborhood distinctions in San Francisco rap music, in the men congregating on corners like Cortland and Moultrie in Bernal Heights, I saw and heard the echoes of these earlier times. The film also has some value as an artifact of the type of program it was made to promote, Youth For Service. Considering what happened with street violence in the rest of the century, it would be easy to laugh at the naïveté of this simple program. (Others like it exist today, of course.) It seems to be the sort of thing Tom Wolfe humorously ridiculed in his 1970 essay “Mau-mauing the Flak Catchers.” But the history of what actually happened in the decades after this hopeful-seeming project is really about much bigger forces: the Vietnam War, racism, the isolation of red-lining and the freeway system, the collapse of manufacturing in the United States, Reagonomics, the prison industrial complex, and crack cocaine and other hard drugs. The 50 years since the film saw many changes in San Francisco, but there was some continuity to the story. Here’s an idealized bookend to that period. And it is something of a bookend, because now, San Francisco has definitely entered some kind of new era. It’s the capital city for one of the fastest growing, most powerful industries in the world. Its high quality housing stock — in enforced shortage — is some of the most expensive anywhere. There is still grim poverty and occasional, horrific violence — like the massacre in Hayes Valley this winter. But for better or worse, the days of a hundred neighborhoods, each with a thousand tough guys holding down the corners, seem now to be a thing of the past. This film is that history.